Please refer to our stock # 20007 when inquiring. Fantastic 18th century black dot paste drop earrings set in silver with a bow motif. 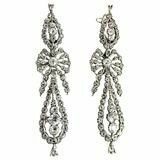 These elegant earrings are rare and desirable, wonderful to wear for evenings on the town. The earrings measure 3 1/4" long and approximately 1" at their widest.